Since our very beginning, we at YTO have been committed to providing customers with superior wheeled tractors. Thanks to our continued efforts over the past decades, now we are able to satisfy our customers by offering them high quality and economically priced tractors. 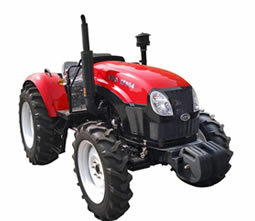 If you do not find the product you are looking for, please turn to other product pages to find more about our wheeled tractor or crawler tractor. As an ISO9000 certified wheeled tractor manufacturer, we are certain you will be satisfied with our products and services.